AVIT Research provides a I²C and SMBus Monitoring and Control Tool. Developed with years of experience in I²C, this tool is an embedded engineer's must. The device is self contained (circuitry integrated into the connector) and does not require any external power source. The design philosophy was such that our I²C tools would not need Drivers or Installation software to use them - even our USB devices do not require an installation disk or drivers downloading from the internet - the USB carries its own drivers and initially appears an a standard Mass-Storage Device to load it's configuration file. 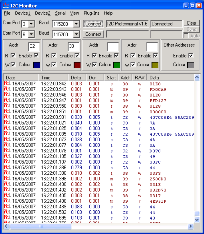 HyperTerminal (supplied with Windows) is used as an interface, this provides data monitoring, filtering, time-stamping, logging and even transmission (Tool and Professional version only) all without any installing of software. There is even Help available. Custom interfaces and functionality can easily be made using the Supplied Software Development Kit (SDK). Full control of the I²C Bus can be achieved using the OCX interface. Windows Software Developer Kit provides full I²C functionality of the device to VB, VBA, C or Java applications through an OCX or .NET Control. * I²C is a trademark of Philips Semiconductor. SMBus is a trademark of Intel Corporation. The I²C Monitor software allows the user to harness the full power of their I²C Interface, Standard or Professional (also works with the discontinued Monitor and Tool hardware). 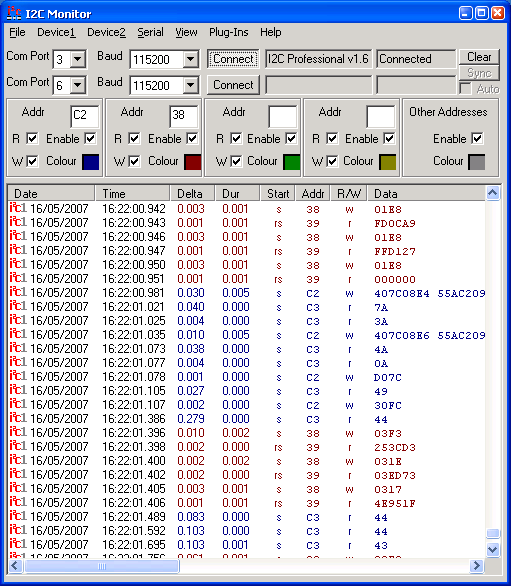 The application connects to the I²C device in 'binary' mode allowing 100% 400kHz busses to be monitored without any danger of loosing data. The Graphical User Interface allows rapid and intuitive control of all I²C functionality, such as filtering and Master transmission of data (Professional/Tool only). User 'plug-ins' can be written to interpret data into meaningful messages, or complete custom interfaces can be written to display data graphically. 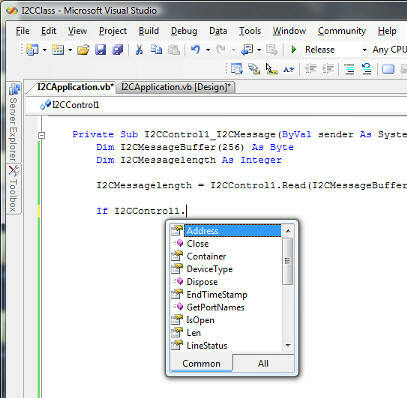 The I2C Control for .net makes Custom I²C Applications a doddle to write. The Control Allows the user to rapidly develop applications in their preferred .net language, whether that be Visual C#, Visual Basic, Visual J# or Visual C++. What's more is the Microsoft express editions of these languages are absolutely free to download. With only 10 user lines of code, you can write yourself a scrolling window I2C Data Logger with timestamps. Click here if you cannot believe it. Download Signed Drivers for Vista, Windows 7 and Windows 8 unzip onto PC, Direct Device Manager Update Driver to the aviti2cpro.inf file.